The Burden of Proof in Florida Pedestrian Accident Cases | DeLoach, Hofstra & Cavonis, P.A. What do I have to prove to get compensation for a pedestrian accident in Florida? It may seem relatively straightforward who is at fault in a pedestrian accident. The driver of a car travels much faster and is far less likely to be injured in a crash, so there's often no question in the victim’s mind that the driver of the car will be seen as responsible for the accident. Unfortunately, these injury claims are rarely open-and-shut cases that offer quick compensation to pedestrians. In order to get payment for medical bills and lost income, pedestrians are required to prove that someone else’s actions directly led to their injuries and losses. In all injury cases, the victim is responsible for providing clear evidence of negligence. Negligence is a legal term that describes an action that a reasonable person in a similar situation wouldn't have done. If someone's negligence caused or contributed to an accident, he or she can be held liable for the costs. The person at fault owed the victim a duty of care. This tenant of an injury case establishes that the negligent party was responsible for acting as safely as possible under the circumstances. If the person at fault is a driver, proof of this duty is contained in state traffic laws that require drivers to be capable and alert at all times. The person at fault breached the duty of care. Many actions that fail to uphold the duty of care constitutes negligence, such as driving distracted, speeding, ignoring traffic signs or signals, and driving while intoxicated. The at-fault party’s negligence caused the victim’s injuries. Negligence in itself isn't enough to win a claim. The breach of care must have directly led to the injuries the pedestrian suffered. For example, texting at the time of the crash may be a direct cause, but sending a text three minutes before the accident is likely not a cause of the crash. The victim suffered actual harm. Victims must provide evidence of the economic losses they suffered as a result of their injuries, such as financial hardship, increased medical bills, permanent disability, and other costs. Who Should Be Held Liable for a Pedestrian’s Injuries? The local municipality. In some cases, a city government may share responsibility for a crash. 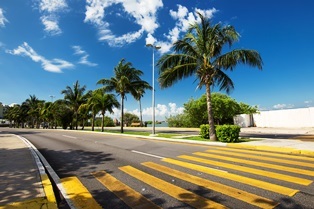 Public entities may be liable for accidents involving poorly-placed crosswalks, malfunctioning traffic control devices, ineffective sidewalk or parking lot maintenance, and other safety hazards. A product manufacturer. You may be able to file a product liability claim if a malfunctioning device caused you to veer into the path of oncoming traffic, such as a scooter or skateboard. Insurance companies. Victims often rely on their insurance providers to pay for medical bills after a pedestrian accident. As Florida is a no-fault insurance state, the pedestrian may exhaust his or her policy and pursue a claim on the driver’s insurance policy. These claims are often met with resistance, and may require a lawsuit to get proper compensation. Another person or entity. A pedestrian usually doesn't have a right to enter the street outside of a crosswalk. If someone was struck because he or she couldn't use the crosswalk, the case may name additional parties that made safe sidewalk travel impossible. For example, you may take action against a driver or passing cyclist that forced you off the curb, a restaurant owner whose tables blocked the sidewalk and forced you to walk in the road, or a construction company that didn't reroute pedestrian traffic during road repairs. The pedestrian. Pedestrians who contribute in some way to their injuries may be assigned a portion of negligence. In Florida, victims can share negligence and still win the injury case, but their damages will be reduced by their percentage of blame for the crash. If you're struggling after a pedestrian accident, we can help you get the justice and compensation you deserve—and we don't collect any fees until your case is won. Simply fill out the quick contact form on this page to set up your consultation with an attorney.